When I went home for a visit a couple weeks ago, I was delighted to see the farm stands were already offering strawberries. I bought a box of them — six baskets for $6 — and ate a bowl of them daily for about a week once I returned to Tahoe. Still, I had about three baskets that needed to be baked into something to keep them from going bad. Good strawberries can’t be left to waste. 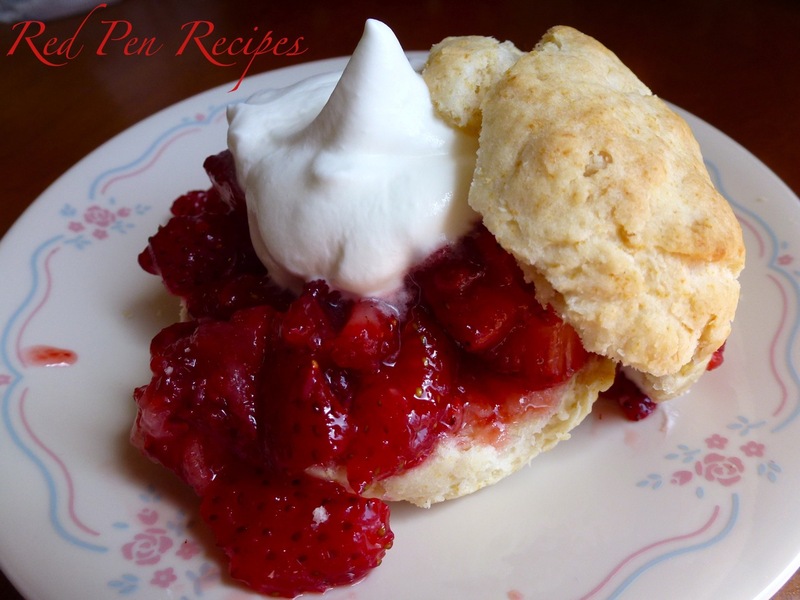 I settled on strawberry shortcake, something I don’t make often, but enjoy quite a bit when it turns out just right. I have never been crazy about those packaged shortcakes sold near the strawberries at the grocery store — the spongey ones that have somewhat of a dip at the top for the strawberries to sit in. I hadn’t made my own biscuits in a long time, so I turned to the Joy of Cooking to see what it suggested. It had a couple options, but I settled on cream biscuits this time around. 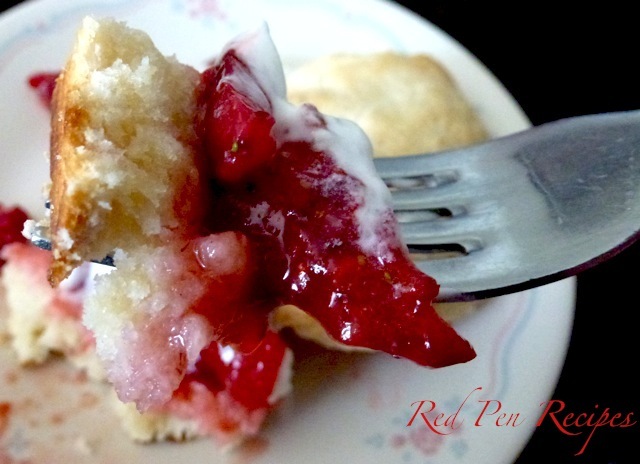 They were, by far, the best ones I had ever made for strawberry shortcake. I am not big on rolling out dough; I prefer to shape it with my hands when I can. I divided the dough into eight pieces and formed them into rounds on a baking sheet. You may also roll out the dough and divide it into more pieces if you’d like. 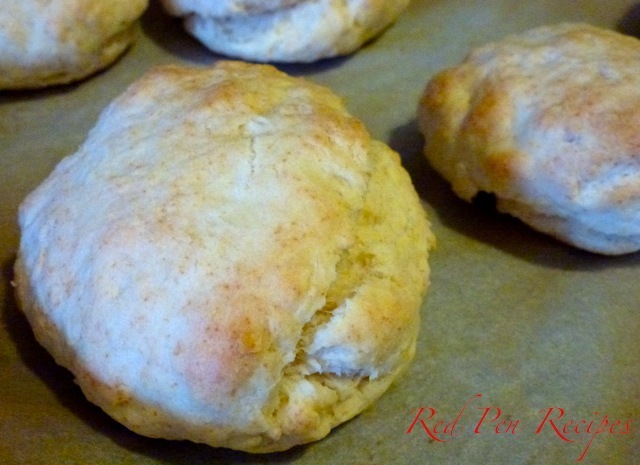 The biscuits were easy and the flavor and texture were just how I hoped they would be. Topped with the macerated strawberries (I added some of Penzeys Vanilla Sugar to the mixture for a bit of extra flavor) and whipped cream, this was the dessert I was craving. I was thrilled. Summer will be here soon enough. Rinse and quarter the strawberries. Using a potato masher or other tool, partially crush the strawberries. Put them in a bowl with the sugar. Set in fridge. Preheat the oven to 450 degrees F. Whisk together flour, baking powder and salt. Add 1 1/2 cups heavy whipping cream. Mix with a rubber spatula, wooden spoon or fork until most of the dry ingredients are moistened. Knead until smooth. Divide the dough into eight parts. Shape into 3-inch rounds that are about 3/4-inch thick. Place on a baking sheet with a sheet of parchment paper. Bake for 12 minutes or until slightly browned. Remove from oven and let cool for 15-20 minutes. Whip the 1 1/4 cups heavy whipping cream until soft peaks form. To assemble, cut the biscuits in half so there’s a top and bottom. Spoon generous spoonfuls of the strawberry mixture onto the bottom half of the biscuit. Top with a large dollop of whipped cream. Top with the other half biscuit. The land of strawberries wants them biscuits!